Oil on canvas, 29 x 38 in. Weir sent seven oil paintings and several etchings and watercolors to the Armory Show. Among them was The Factory Village, which he painted in 1897 and reworked over the years. The view is of the massive mid-nineteenth-century cotton mills of the Willimantic Linen (later American Thread) Company, situated along the WillimanticRiver near Weir’s farm in Windham, Connecticut. With its closely cropped composition and emphasis on light and atmospheric effects in the landscape, the canvas shows Weir’s fully developed Impressionist style. He had trained as an academic painter and first encountered Impressionism as a student in Paris in 1877 where he famously compared the third French Impressionist exhibition to a “Chamber of Horrors.”  Yet, he adopted the style himself about 1890, inspired by his friend John Henry Twachtman. See Milton Brown, The Story of the Armory Show, 2nd ed. (New York: Abbeville Press, 1988), 324-25. Weir’s reworking of the painting is discussed in “Pictures by J. Alden Weir, the Late J. H. Twachtman and Others,” unidentified newspaper clipping inscribed “March 29, 1907,” Julian Alden Weir Papers, Archives of American Art, Smithsonian Institution, microfilm reel 70, frame 270. J. Alden Weir to Robert W. and Susan Martha Bayard Weir, April 15, 1877, reprinted in Dorothy Weir Young, The Life and Letters of J. Alden Weir (New Haven: Yale University Press, 1960), 124. The others are Willimantic Thread Factory (1893, Brooklyn Museum), Willimantic (1893-1897, private collection), U.S. Thread Company Mills, Willimantic, Connecticut (ca. 1893-97, National Gallery of Art, Washington, D.C.), and Willimantic, Connecticut (1903, Oliver James Collection of American Art, Arizona State University, Tempe). 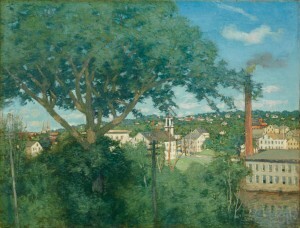 According to the notebook entry for The Factory Village in the Julian Alden Weir Papers, the painting was exhibited with the Ten American Painters in 1898; at Montross Gallery in New York in 1907; and at Montross Gallery and the Century Association in New York, and the Carnegie International Exhibition in Pittsburgh in 1911, and at the Pennsylvania Academy of the Fine Arts in Philadelphia in 1916. Julian Alden Weir Papers, microfilm reel 126, frame 726. Joseph Edgar Chamberlain, “More of the International Exhibition,” New York Evening Mail, February 21, 1913, 6. William B. McCormick, “Success of International Exhibition Disproves Statements that Art is Dead,” New York Press, March 2, 1912, sec. 2, 6.